Does Mouth Breathing Cause ADHD In Kids? Oxygen deprivation and snoring are linked to brain health in kids. Kids that have a habit of mouth breathing often have crooked teeth. As a dentist, I dig a bit deeper into the mouth-body connection. These kids also usually snore and grind their teeth. Dig a bit deeper, again, and I find they have poor gut health and food allergies. If this sounds like your kid, it’s important to know the mouth-body connection. All of these problems are related to oxygen deprivation and may put your kid at risk of ADHD. Have ever noticed your kid breathing through their mouth? It may happen when eating, sleeping or watching TV. For parents, it’s common to think that your child will grow out of this habit. Mouth breathing is also related to kids getting braces. You may believe that your kid can just get orthodontic treatment to fix the problems later on. This may be the case, but it doesn’t address the core problem. Crooked teeth and mouth breathing may be two of the biggest signs a child is at risk of ADHD. In fact, children who breathe through their mouths can be at risk of serious illness. Mouth breathing can be the sign of development issues related to jaws, airways and facial growth. Dentists and kids’ health experts have learned that long-term health issues can be related to oxygen deprivation. Sleep disorders and ADHD symptoms are both related to small jaws, sleeping with mouth open and crooked teeth. With ADHD an increasing problem, if you’re a parent who wants healthy kids, children’s dentistry is becoming more important. Some estimates seem to show that up to 9% of all children are now prescribed ADHD meds. Why would you have your kid take braces if you can help your kid breathe better, sleep better and prevent braces? It all begins with their mouth and teeth. But you can also lower their risk of ADHD. 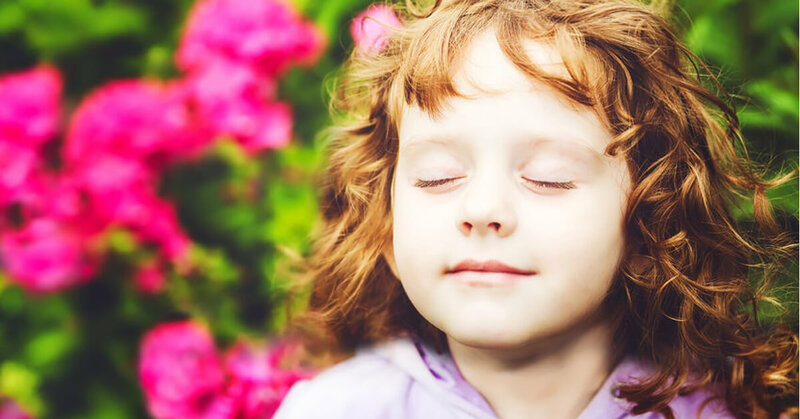 To explore this topic, we talk about how breathing affects the brain. Next, we detail how teeth grinding and breathing can affect sleep. We then talk about the symptoms of poor gut health and allergies, and how they link to ADHD and getting braces. Finally, we show you how to recognize abnormal jaw development and breathing patterns. Your kid’s jaws house the nasal passages and our mouths, teeth and soft palate. When the jaw develops normally, all of these structures are large enough to do their jobs. Mouth breathing stops normal development. When you breathe through the nose, the tongue presses against the palate, making it wider. The muscles of the tongue posture also hold open the airways. Mouth breathing leads to a thin jaw and a long, narrow face. Kids with these jaw problems of end up getting braces. They are also at risk of a host of other health problems. These can include sleep apnea, allergies, poor gut health and ADHD symptoms. While many people suffer from problems when breathing, the problem is often overlooked. Children don’t outgrow snoring or mouth breathing. And much of the damage to their brain occurs during childhood. The way you breathe impacts the autonomic nervous system. Nasal breathing activates the parasympathetic nervous system. This is crucial for digestion, and to balance stress hormones. The way that we breathe affects our brain. When your child mouth breathes, they lose the calming benefit of nostril breathing to their brain. Mouth breathing also causes oxygen deprivation by delivering cold, dry air to the lungs. Kids sleeping with mouth open can cause oxygen deprivation and increase stress levels. Your kid’s brain is alerted that there is a problem; as a result, better sleep is never achieved. Kids that snore are not normal. Kids that mouth breathe during the day can often be found sleeping with mouth open. The muscles that support the airways during the day relax during sleep. Therefore, kids who mouth breathe during the day do so during sleep, and they also probably snore. Poor sleep breathing can lead to sleep apnea symptoms. Sleep apnea is defined as pauses in breathing for up to 30 seconds while asleep. This can be scary for parents and can cause oxygen deprivation to the brain. Snoring and sleep apnea in kids is a serious health problem. Children’s dentistry may be the first to pick up your kid’s risk of sleep apnea. Kids with small jaws and crooked teeth have smaller airways. There might also be underlying sleep issues at hand that need attention. Your child’s breathing should be silent and easy, if you can hear them gasping for air in their sleep it is a problem. Reasons for snoring is associated with crooked teeth, small jaws, a lack of oxygen and sleep deprivation. Lack of oxygen and poor sleep can then lead to ADHD symptoms. A kid that is doing poorly at school and has afternoon sleepiness may simply have a lack of oxygen. While teeth grinding (also known as bruxism) is usually thought of as an adult problem, it affects many kids. If your kid is grinding his or her teeth, you need to take action now. Worn teeth due to teeth grinding may also mean lack of oxygen to the brain. Sleep is crucial for your child’s brain growth – your kid’s dental health is a great sign of this. Teeth grinding is a sign of “arousals” during sleep. These arousals are related to when your kid sleeps, their muscles relax and airways close. If the airways close, the brain then pushes the child’s jaw forward, causing ‘bruxing’. Teeth grinding is the brain trying to open the airway. Teeth grinding often won’t wake a child up. However, these periods disrupt your kid’s sleep. The arousal is a sign that a kid’s brain is in oxygen deprivation. It may also show a lack of high-quality sleep that is crucial for a kids brain. Your kids’ dental health is an important sign of night time breathing. If they suffer from teeth grinding, they can suffer later in life. They may also suffer from anxiety, poor behavior, restlessness and hyperactivity. These symptoms can often be wrongly diagnosed as ADHD. If any of this sounds familiar, it’s time to schedule a kids dentistry appointment. Your child may need to see more than one health professional to sleep better. Breathing and ADHD explores the mouth-body connection in kids. Sleep apnea, getting braces, teeth grinding and snoring all impact a kids brain development. But breathing is not only the only problem that can cause ADHD symptoms. Chemical and oral flora imbalances can travel through to a child’s gut. Intestinal bacteria affect the entire body, including the brain. Your kid’s gut health can impact their mood, learning, and ability to concentrate. Healthy digestion influences the brain through neurotransmitters, gut health, and immune function. An imbalanced gut is now thought to directly impact the brain. Breathing and oxygen deprivation should always be considered alongside healthy digestion. The oral-systemic link shows gut health and dental health in a two-way cross talk. Recent studies have shown that there is a connection between childhood allergies and ADHD symptoms. Allergies and sinus blockages can cause breathing problems. We have already learned that these issues can cause oxygen deprivation. Kids who suffer from allergies have blocked sinus and often mouth breathe. These kids may also show ADHD symptoms. Oxygen deprivation in kids may begin in the gut but shows how the mouth connects to brain health. Addressing allergies, helping better sleep, and nasal breathing may prevent ADHD in kids. If your child has signs of allergies – you should schedule a children’s dentistry appointment. How can you recognize a child with breathing problems? Listen to their breathing. – Can you hear your child breathing while they are awake? Is their mouth open when they are sitting still? Do they clearly breathe through their mouth? Can you hear them snoring while they are asleep? If you have answered yes to any of the above questions, schedule a kids dentistry appointment. Look at their face. – Children who have crooked teeth and thin face are more likely to suffer from breathing problems. A lack of space in the jaw can lead to an overcrowding of the tongue and teeth. These causes the tongue to block airways during sleep. If your child has a thin, long face, high palate or crowded teeth, talk to your dentist. There is a real link between mouth health, breathing, and healthy kids. It is important to recognize the oral-systemic links, and know when to pick the signs. Many dentists will suggest orofacial muscle training in order to reintroduce normal nasal functions. Orthodontic treatments can also be an option to develop your child’s jaw, airways, and face. This can help them to breathe and sleep better, and in some cases reduce their ADHD symptoms. If you know a child who mouth breathes share this link online. Don’t forget to subscribe to our newsletter. Do you have experience with your kid’s dental health and ADHD? Join the conversation and leave a comment below. I have 6 year old son with the crooked teeth. I see some underlying symptoms of ADHD. He grinding his teeth a lot whole night. How can I prevent him to develop ADHD ? Any suggestion? Get checked by an ENT for nasal patency and airway orthodontist. Also check their vitamin D levels and digestive health. Curious and high-spirited young children can’t focus their attention on anything for long, some more so than the others. But, is the inability to pay attention always a sign of ADHD? This is a good point. We want to have sensible assessment alongside sleep, breathing and behavioral problems. We shouldn’t be putting kids into buckets. Any of the sleep/snoring dental issues alongside should indicate need for further investigation.